iPhone cases come in a wide variety of materials including hard plastics, flexible silicone rubbers and thermoplastics, aluminum, wood and leather. But one abundant material has been left out from this group until today. A an upcoming British case manufacturer by the name of SX-One is looking to revolutionize the case industry with the SXONE - the world's first iPhone 5 case made out of stone. It's literally a case that's as hard as a rock, yet machined to Incase Slider-like case specifications to be used as a minimalist protective case with very unique marble texture and patterns that'll disguise your iPhone as being a part of your stone countertop. Known for adapting to cool temperatures, the 'stoneafide' SXONE case offers a unique earthy feeling Fred Flintstone would have approved of. 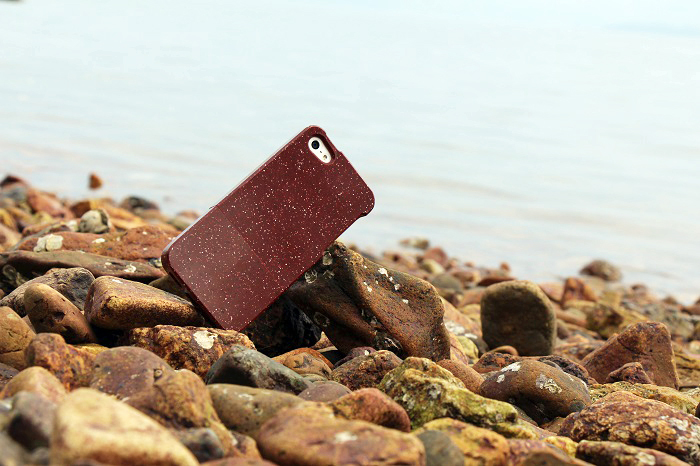 And although the SXONE stone case is made from an artificial blend of stone that's easier to machine into the necessary shape and curves of an iPhone case, the end result is a stone case that's lighter than natural stone yet retains its natural properties. SX-ONE does warn its SXONE stone cases are prone to damage if dropped from a high altitude of undefined height. It's highly likely for stone to chip and even crack when faced with impact, leading us to believe that stone and glass-made protective iPhone cases aren't going to be anything more than a short-lived niche. The SXONE stone case is available to be pre-ordered on Kickstarter in three different stone colors for the iPhone 4/S and iPhone 5 for $49 and $52 (estimated), respectively.